Korean barbecue with premium dry-aged beef cooked tableside. 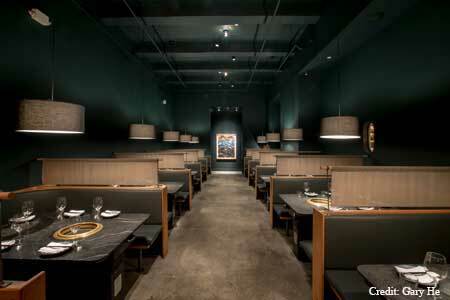 About the restaurant & décor: Cote’s two dining rooms are dark, modern and minimalist, with blue-green walls, concrete floors and black stone tables with inset yakiniku grills for cooking meat. Guests can gaze at aging beef behind glass, bathed in red light, as they peruse the menu. Likes: Butcher’s Feast; reserve porterhouse; rosé slushie. 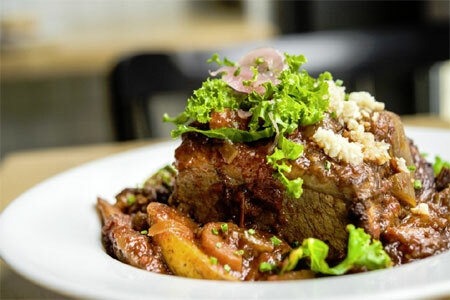 Food & Drinks: Beef is the focus at Cote. Owner Simon Kim sources premium steak and dry-ages it himself for a week to up to several months in Cote’s own downstairs aging room. Then he treats it to an upscale take on Korean barbecue. The Butcher’s Feast lets diners savor the complex flavor of that beef, served in four cuts. It comes with banchan, a selection of salads, egg soufflé, kimchi stew and fermented bean-paste stew, and vanilla soft serve drizzled with caramel for dessert. At $48 per person, the fixed menu is a bargain. Servers expertly grill the meat at your table; it can be tempting to fiddle with the browning beef, but they know what they’re doing. There are also reserve cuts, like porterhouse aged at least 110 days, plus market fish. Pair it all with a rosé slushie, which arrives with a paper flamingo, or wines from around the world.